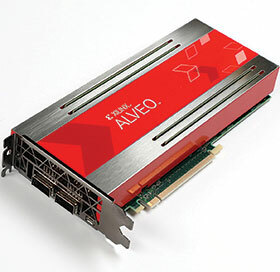 At the recently held Xilinx Developer Forum (XDF), Xilinx launched the Alveo portfolio of powerful accelerator cards designed to increase performance in industry-standard servers across cloud and on-premise data centres. The platform delivers advanced performance at low latency when running key data centre applications like real-time machine learning inference, as well as video processing, genomics and data analytics, among others. The Alveo U200 and Alveo U250 are powered by the Xilinx UltraScale+ FPGA and are available now for production orders. Like all Xilinx technology, customers can reconfigure the hardware, enabling them to optimise for shifting workloads, new standards and updated algorithms without incurring replacement costs. For machine learning, the Alveo U250 increases real-time inference throughput by a claimed twenty times versus high-end CPUs, and more than four times for sub-two-millisecond, low-latency applications versus fixed-function accelerators like high-end GPUs. Moreover, Xilinx says the cards reduce latency by three times versus GPUs, providing a significant advantage when running real-time inference applications, and that some applications like database search can be radically accelerated to deliver more than ninety times, versus CPUs. Alveo is supported by an ecosystem of partners and OEMs who have developed and qualified key applications in artificial intelligence/machine learning, video transcoding, data analytics, financial risk modelling, security and genomics. Fourteen ecosystem partners have developed applications for immediate deployment. Additionally, top OEMs are collaborating with Xilinx to qualify multiple server SKUs with Alveo accelerator cards. It took Avnet less than 1000 days to take Hanhaa’s concept, prototype it, refine it and get the first 20 000 units manufactured.